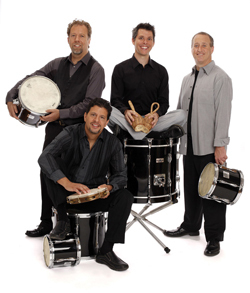 Friday, April 17, 2015, 8:00 p.m.
"Spellbinding", "astonishing" and "immaculate" are all words that critics have used to describe the Ethos Percussion Group. The New York Times has hailed the group for its "expert togetherness, sensitivity and zest." The superlatives just keep coming as Ethos enters its third decade of exceptional music-making and collective devotion to the world of percussion. All individually accomplished artists, Ethos members Trey Files, Michael Lipsey, Eric Phinney and Yousif Sheronick are equally at home with contemporary classical repertoire or in collaborations with master musicians from non-Western traditions. Their unique performances seamlessly transport global influences into Western chamber music to create a visually and aurally compelling experience. The ensemble's critically-acclaimed performances regularly feature numerous commissions and world premieres; traditional influences from India, West Africa and the Middle East; and landmark works by composers such as John Cage, Philip Glass, Lou Harrison, Steve Reich and Frank Zappa. Ethos has performed at major concert venues across the United States and the United Kingdom, including Carnegie Hall, Lincoln Center's Walter Reade Theater, the Bermuda Festival, London's Wigmore Hall, the Krannert Center, the Library of Congress, and the Percussive Arts Society International Convention. Collaborators have included the Kansas City Symphony, Grammy Award-winning frame drum master Glen Velez, Bernard Woma (Ghana) and M'Bemba Bangouran (Guinea), as well as North Indian masters Pandit Samir Chatterjee (tabla) and Ramesh Misra (sarangi). Over the past thirteen years, Ethos has commissioned more than twenty-five new works for percussion quartet from composers steeped in the musical traditions of Argentina, Brazil, China, Cuba, Ghana, Guinea, India, Indonesia, Korea, Palestine and the United States. Since its founding in 1989, Ethos has demonstrated its commitment to advancing the percussive arts in education as well as performance. In addition to presenting clinics and master classes at institutions such as The Juilliard School, Eastman School of Music, University of Illinois, and Berklee College of Music, Ethos has worked with thousands of students in New York City's public schools through concert and classroom activities. Long-term educational residencies elsewhere in the country have included programs with Sun Valley Center for the Arts and Quad City Arts. Ethos is currently ensemble-in-residence at Lehman College, Bronx, NY. Purchase in person at Travel Salem, 181 High St. NE, 503-581-4325, 1-800-874-7012. For further information contact the Willamette University Music Department at 503-370-6255 or email Diane Trevett at dtrevett@willamette.edu.